Effects. Elsevier Applied Science, London, 1991, 338 pp. Larson, R. A., and Eric J. Weber, Reaction Mechanisms in Environmental Organic Chemistry. CRC Press, Boca Raton, FL, 1994. Schwarzenbach, R. P., P. M., Gschwend, and D. M. Imboden, Environmental Organic Chemistry. Wiley, New York, 1993. Thornton, J., Pandora's Poison: Chlorine, Health and a New Environment, MIT Press, Cambridge, MA, 2000, 539 pp. Ravishankara, A. R., and E. R. Lovejoy, Atmospheric lifetime, its application and determination: CFC-substitutes as a case study, J. Chem. Soc. Faraday Trans. 90(15), 2159-2169 (1994). Alexander, M., Biodegradation and Bioremediation, Chapter 13, Academic Press, Orlando FI, 1994. 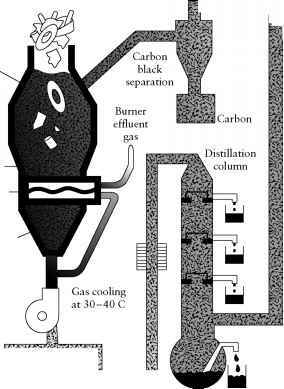 Altwicker, E. R., Formation of PCDD/F in municipal solid waste incinerators: Laboratory and modeling studies, J. Hazardous Mater., 47, 137-161 (1996). Bumb, R. R., and eleven others, Trace chemistries of fires: A source of chlorinated dioxins, Science, 210, 385-390 (1980). Boyd, S. A., M. D. Mikesell, and J.-F. Lee, Chlorophenols in soils, in Reactions and Movements of Organic Chemicals in Soils, B. L. Sawhney and K. Brown, eds. Soil Science Society of America, Madison, WI, 1989. Kuhn, E. P., and Suflita, J. M., Dehalogenation of pesticides by anaerobic microorganisms in soils and ground water—A review, in Reactions and Movements of Organic Chemicals in Soils, (B. L. Sawhney and K. Brown, eds)., pp. 111-180 Soil Science Society of America and American Society of Agronomy, Madison WI, 1989. Schwarzenbach, R. P., P. M., Gschwend, and D. M. Imboden, Biological Transformation Reactions, in Environmental Organic Chemistry, Schwarzenbach, Gschwend, and Imboden, eds., pp. 485-546. Wiley, New York, 1993. Singh, V. P., Biotransformations: Microbial biodegradation of health-risk compounds, in Progress in Industrial Microbiology, Vol. 32. Elsevier, Amsterdam, 1995. Wackett, L. P., Dehalogenation reactions catalyzed by bacteria, in Biological Degradation of Wastes, A. M. Martin, ed., pp. 187-203. Elsevier Applied Science, London, 1991. Hansen, L. G., Halogenated aromatic compounds, in Basic Environmental Toxicology, L. G.
Cockerham and B. S. Shane, eds. pp. 199-230. CRC Press, Boca Raton, FL, 1994. Jefferies, D. J., The role of the thyroid in the production of sublethal effects by organochlorine insecticides and polychlorinated biphenyls, in Organochlorine Insecticides: Persistent Organic Pollutants, F. Moriarity, ed., pp. 131-230. Academic Press, New York, 1975. Moriarity, F., Ecotoxicology, pp. 109-115. Academic Press, New York, 1983. Peakall, D., p, p'-DDT: Effect on calcium metabolism and concentration of estradiol in the blood, Science 168, 529 (1970). Davis, D. L., and H. L. Bradlow, Can environmental estrogens cause breast cancer? Sei. Am. pp. Intelligenee and Survival? A Seientifie Deteetive Story. Dutton, New York, 1996. Hileman, B. Environmental estrogens linked to reproductive abnormalities, cancer, Chem. Eng. News, pp. 19-23, Jan. 31, 1994. McLachlan, J. A., and S. A. Arnold, Environmental estrogens, Am. Sei., 84, 452-461 (September-October 1996). Safe, S. E., Environmental and dietary estrogens and human health: Is there a problem? Environ. Health Perspeet. 103, 346-351 (1995). Büchel, K. H., ed., Chemistry of Pestieides. Wiley, New York, 1983, 517 pp. Safety, ACS Symposium Series 524. American Chemical Society, Washington, DC 1993. Heitefuss, R., Crop and Plant Proteetion. Ellis Horwood, Chichester, U.K., 1989. Somasundaram, L. and J. R., Coats, eds., Pestieide Transformation Produets, ACS Symposium Series 459. American Chemical Society Washington, DC , 1990. ACS Symposium Series 412. American Chemical Society, Washington, DC, 1990. National Research Council, Pestieide Resistanee, National Academy Press, Washington, DC, 1986.
science, New York, 1989. Nordlund, D. A., R. L. Jones, and W. J. Lewis, eds., Semioehemieals: Their Role in Pest Control, Wiley, New York, 1981, pp. 306. Duke, S. O., J. J. Menn, and J. R. Plimmer, eds., Pest Control with Enhaneed Environmental Safety, ACS Symposium Series 524. American Chemical Society, Washington DC, 1993. Howse, P., I. Stevens, and O. Joves. Inseet Pheromones and Their Use in Pest Management. Chapman and Hall, London, 1998. Wolfenbarger, L. L., and P. R. Phifer, The ecological risks and benefits of genetically engineered plants, Science, 290, 2088-2093 (2000). Luttrell, R. G., G. P., Fitt, F. S. Ramahlo, and E. S. Sugonyaev, Cotton management: Part 1. A worldwide perspective, Ann. Rev. Entomol., 339, 517-526 (1994).